Thomas & Betts Non-metallic knockout bushing in black color, has high-impact thermoplastic construction for automotive performance applications. It measures 1.2-Inch ID x 1.5-Inch OD. 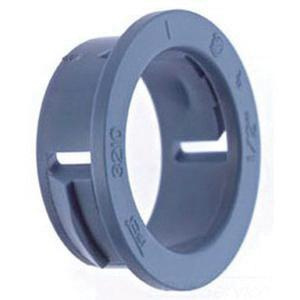 This bushing of trade size 1-Inch, features provides smooth and rounded insulation surface for easy wire pulling. The bushing withstands temperature rating of 105 deg C. The bushing is ideal for use with 1.375-Inch knockout to bush knockout openings in metal boxes or 0.095-Inch enclosures. It suitable for rigid and IMC conduits. Bushing is UL listed, CSA certified and RoHS compliant.